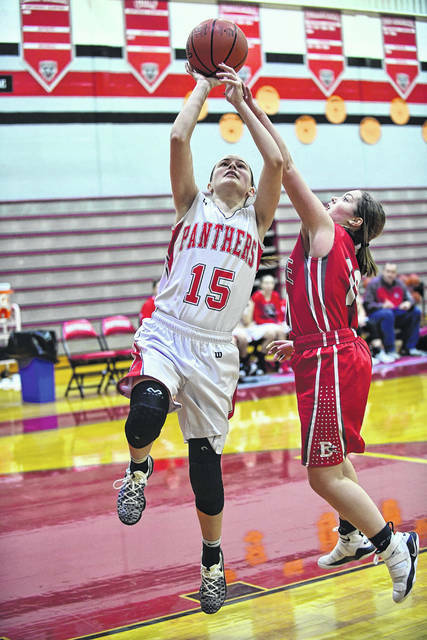 Tri-County North senior Shyanna Baker will play a key role for the Panthers this season. She was among the top rebounders in the Cross County Conference last season. LEWISBURG — Tri-County North’s girls basketball team will be looking to replace the loss the of three key players from a team that went 9-14 last season. The Panthers lost two players to graduation and one who transferred prior to the school year, but will have five seniors back. North does return the leadership of senior Shyanna Baker, who was among the Cross County Conference’s top-20 rebounders last year, and it’s top defender in sophomore Sidney Jackson. Gabrielle Rupp also saw significant time on the varsity team last year. Rounding out the roster for the North will be Maddy Flory, Mackenzie Lykins, Lexi Delong, Mackenzie Bacher, Jenna Klingenberger, Kelli Cooke, Faith Estep, Patience Getter and Rachale Dempsey. The Panthers are scheduled to begin the season at Northridge in the CCC/SWBL Classic on Friday and Saturday, Nov. 23-24. North will meet the host Polar Bears on Friday at 7:30 p.m. and will play Carlisle on Saturday at 6 p.m. The Panthers will host Covington on Thursday, Nov. 29 for their first CCC contest of the season. https://www.registerherald.com/wp-content/uploads/sites/41/2018/11/web1_tcngbk4.jpgTri-County North senior Shyanna Baker will play a key role for the Panthers this season. She was among the top rebounders in the Cross County Conference last season.